It’s been fun designing promo bits for my classes. Combines my passion for photography and design with my passion for yoga and teaching. Again, not going to win any design awards, but it’s great for nourishing my need to be creative. Join me for a class on Tuesdays! 11am/12pm/7:15pm All three classes are totally different. 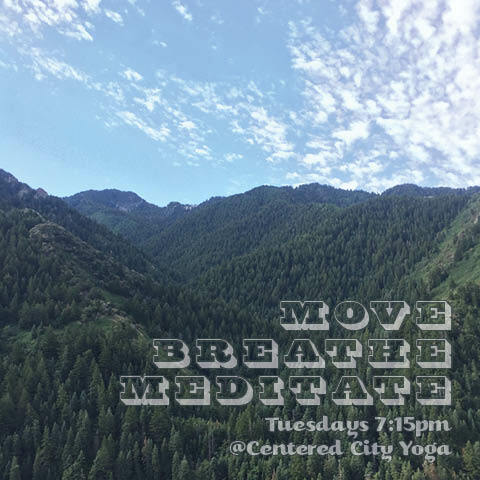 Restore is very slow and mellow, Express is a 45-minute mix of Core strengthening and some Restorative, and Move Breathe Meditate combines guided meditation and breath work with asana. It’s mellow, but there is still core work. You can still break a sweat if you want! I've been teaching a yoga class at Centered City for just over a couple months now. I only teach one regular class, Move Breathe Meditate on Tuesdays at 7:15pm. (Come check it out--It's a mix of asana, pranayama, and meditation.) Teaching at Centered City has given me the opportunity to sub other classes, though, which has been a tremendous help to grow as a teacher. Ultimately I would like to teach 4 classes each week, work with private clients, teach group events, teach at retreats, and host workshops incorporating my feng shui practice. One of the things I love about my regular class on Tuesday nights is the time I spend culling wisdom and meditation practices to share. In the beginning it was a huge challenge--most of my focus in class was spent thinking about what comes next in the sequence or the directions to give to get in and out of a pose. It takes practice to get there! When you're looking at your notes or nervous about performing in front of a group of strangers, it's difficult to think of wisdom to share. Now that I have the sequence down (timing was a huge challenge in the beginning), I can focus more on students and even improvise. It's very exciting to experience growth in any endeavor. Come check out my class!